The feeling of music hanging around on a separate track from your conscious mind (“as if the music existed independently of him, flowing along in a corner of his brain” (61)); of gorgeous, traumatised Weisfeld explaining the magic of harmonics (72/73); and Fredericks witnessing Claude’s intense emotional connection to music (“He wanted to leave his body and go chase the music into whatever hyperspace had swallowed it” (96); and of music being delivered through a muse (329). I am particularly interested in the influence of music on writing. This started long ago, and was revived during my interview with Willy Vlautin, American novelist and famous alt-country musician. I’ve come to believe a writer who can feel and understand musical rhythm has a more natural understanding of rhythm in writing. Frank Conroy is the best example of this yet. 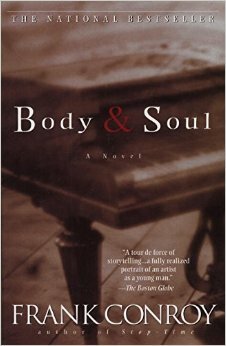 Body & Soul is far-reaching in its cast and its complex weaving of storylines. The characters are unique and believable. I adored his mother Emma’s unexpected love-interest and also Weisfeld’s back story. The book has flaws. I know that. But despite the (at times) lack of depth in Claude (and that he has life too easy) and the at times too-coincidental plot tie-ups, I love this book. It moved me deeply and I will buy a copy so I can re-read it over and over again. Personal note: I originally read this because Frank Conroy was Paula Morris’ teacher at Iowa Writers’ Workshop, and Paula is my writing teacher at the University of Auckland.